Restaurant Week and I have a love/hate relationship. When it first started, I loved it – the menus were significantly discounted and we were able to try a bunch of new restaurants we wouldn’t normally be able to afford. I think we would try 2 or 3 restaurants during Restaurant Week, back in the day! After a couple of years, though, restaurants started upping the price of their menus, so that the higher end places ended up with a $40 menu (and there are $20 and $30 menus). Granted, a meal at 1500 Ocean will probably cost you more than $80 per couple, but $80 is still a lot of money to spend for a regular night out. I’m not even sure I request such an extravagant meal on my birthday! A couple of years ago, I was invited to preview a Restaurant Week menu. I was given a choice of dates and restaurants and I could bring a guest with me (no one likes eating alone). Last year, we previewed Avenue 5 and I loved it. I still think about the gnocchi I ate there, even though we haven’t been able to make it back in a year. This year, the lovely people at McFarlane Promotions asked if I’d be interested in previewing a Restaurant Week menu again, compliments of them. I was a little concerned when I found out we’d be assigned a restaurant instead of being able to choose from a few choices, since there can be some duds on the RW list (sorry, but it’s true). I was even further concerned when I found out I’d been assigned Tom Ham’s Lighthouse. Granted, it had been years since I’d eaten there, but there was a reason we never went back! Their posted menu on the RW site is a little odd, and the optional menu items sounded better than the “standard” menu. The 2011 Restaurant Week Menu you receive at the restaurant lays it out a little clearer, and you can see that there are actually 3 entree menus: a $30, $40, and $50 option. I had asked Cami to be my date, to give Travis a night to himself (which he used to drink beer at the lame British Pub in not-quite-Poway), and we chose items off the $30 menu. 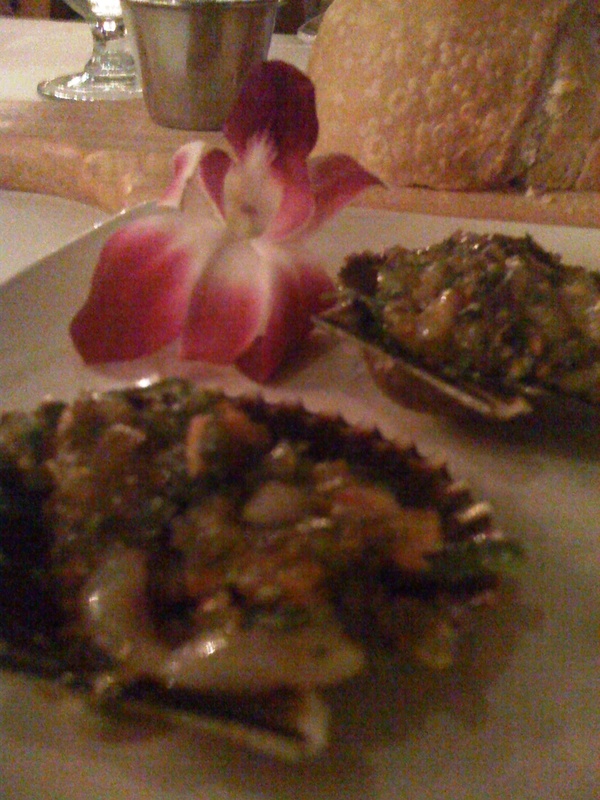 The scallop poke was tasty, although I think the scallops got lost in the sauce and seaweed salad. 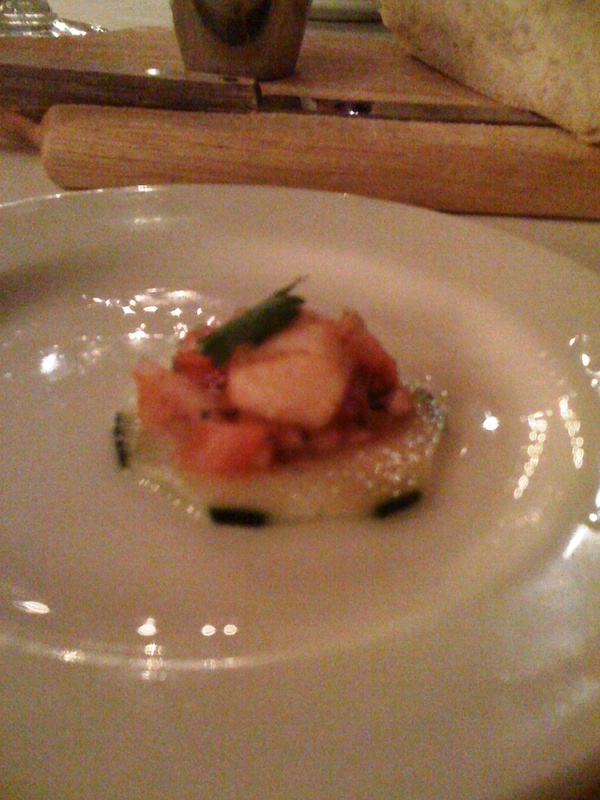 We each got an appetizer (3 scallop shells), we just both picked the poke. Cami’s halibut was perfectly cooked and very flavorful. The green bean bundle was al dente with perfectly cooked bacon around it – not crisp but not flabby, either. 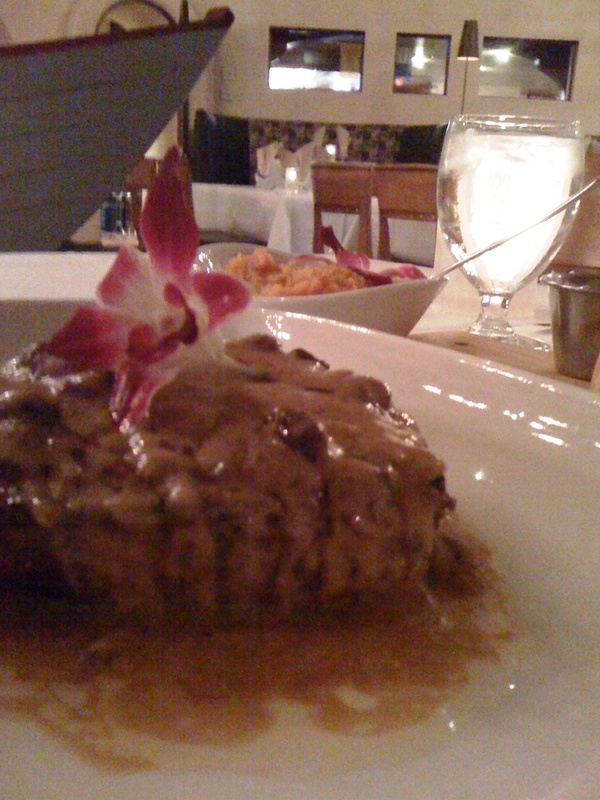 I loved the rum raisin cream sauce over the pork porterhouse. It was actually so large a serving, I took half of it and most of the sweet potatoes home with me. It was a little odd to have a plate of pork and a dish of potatoes (where’s the vegetable? ), but it was all delicious. No pictures of dessert, but Cami’s cheese plate was loaded with cheeses and flat bread. The peach cobbler was tasty, as peach cobbler should be, but nothing outstanding. I would say go for the appetizers and entrees, definitely. Chef Chris came out to talk to us at the end of our meal, explaining how he had been there for 3 years and was slowly updating the menu. He said there are a lot of long-time regulars who dine with them, so you can’t just take their favorite dishes off the menu. You have to ease into it. I think they’re doing a good job – their regular menu seems to have a nice balance of traditional dishes and some updated ones with new flavors. Some of their kitchen staff has been there since the restaurant started, which says something about their loyalty and tenure. The view from the restaurant is stunning at night – you get to see the perfect skyline of downtown across the ocean. San Diego Restaurant Week starts this Sunday, January 16th and runs through Friday, January 21st. Enjoy 3-course meals for either $20, $30 or $40 per person at participating restaurants around town. 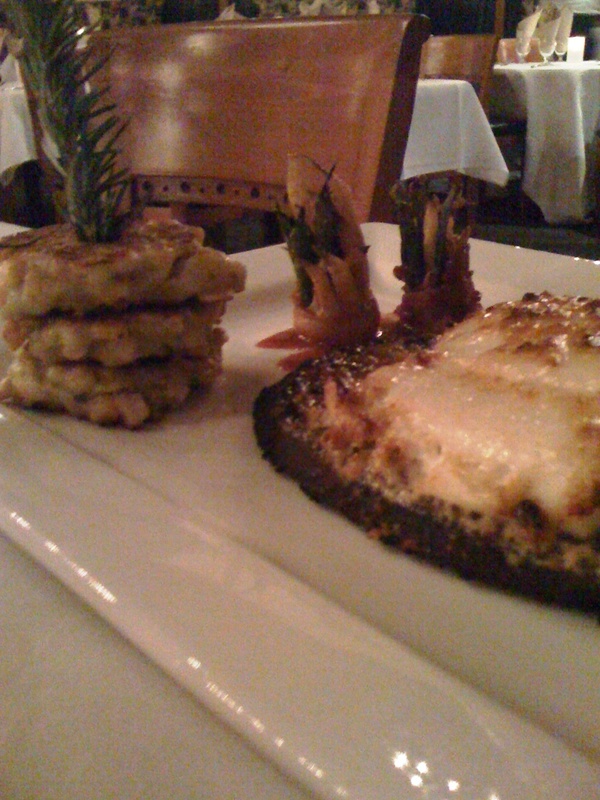 This entry was posted in food, product review, restaurants. Bookmark the permalink.